Chickaree, a name given, from its loud chattering note, to the red, Hudson bay, or pine squirrel (sciurus Hudsonius, Pall.). The body is stout, 7 to 8 inches long, and the tail rather less, narrow and flat; ears moderate, broad, tufted at the tip. The color above and on the sides is a mixed black and grayish rusty, with a broad wash of bright ferruginous down the back and upper surface of the tail; dull white below; tail rusty at the margin, within which is a narrow black band; there is often a black line on the flanks separating the colors of the sides and belly; soles hairy or naked according to the season. It is found from high northern latitudes to the Mississippi, and throughout the northern and middle Atlantic states in elevated regions. It is active, graceful, fearless of man, cleanly, and industrious in laying up a winter supply of food; it sometimes makes its nest in outbuildings; it is very lively all winter, eating its store of nuts, and the seeds of pines and firs; in cold climates it burrows in the ground at the foot of some large coniferous tree. Its flesh is tender and well-flavored; it is less gentle and easily tamed than the gray squirrel. 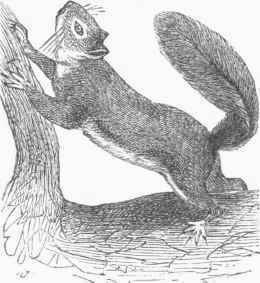 It much resembles the common squirrel of Europe (S. vulgaris, Linn. ).